Guardians of the Galaxy 46 was cover dated March 1994 and was on sale January 1994, sharing the spinner racks with The Breed #1, Excalibur #75, Legends of the World’s Finest #1, Rune #1, Under a Yellow Sun #1 and X-Factor #100. 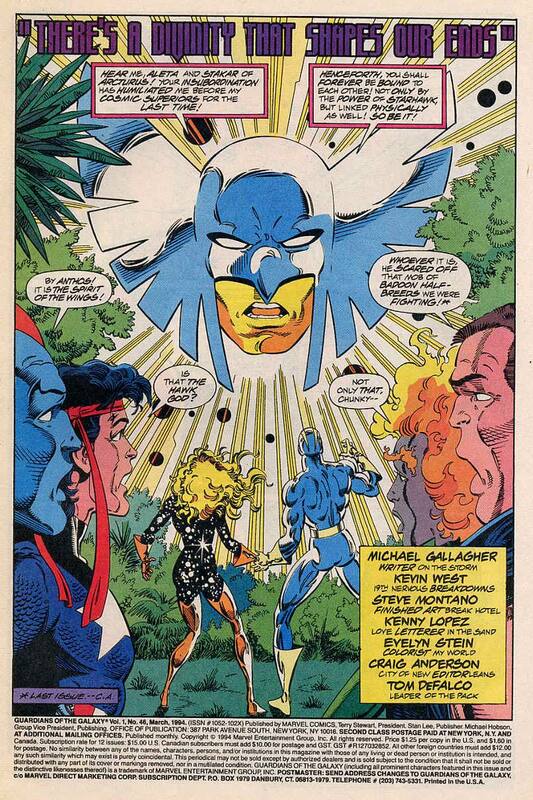 There’s a Divinity that Shapes our Ends was written by Michael Gallagher, pencilled by Kevin West and inked by Steve Montano and opens with the Arcturian Hawkgod berating the two Starhawks and telling them that they are now physically linked for humiliating him by their behaviour. 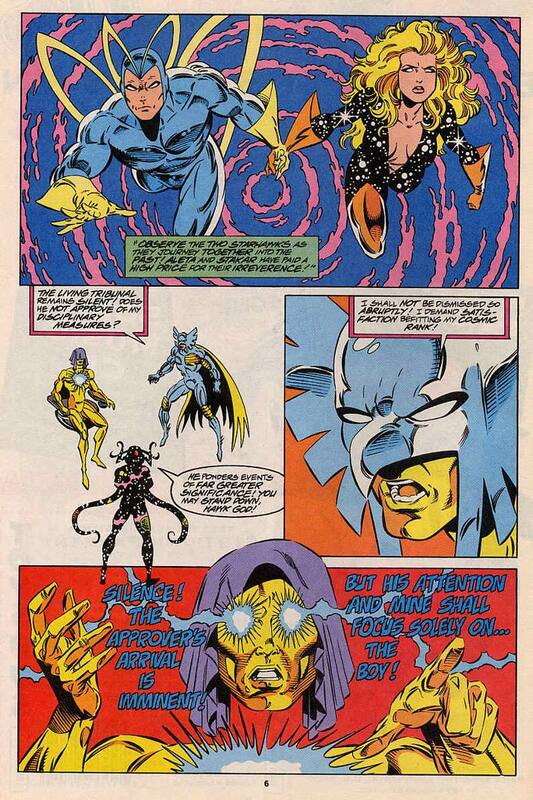 The two agree to travel back in time and undo the Time Jolt’s effects. 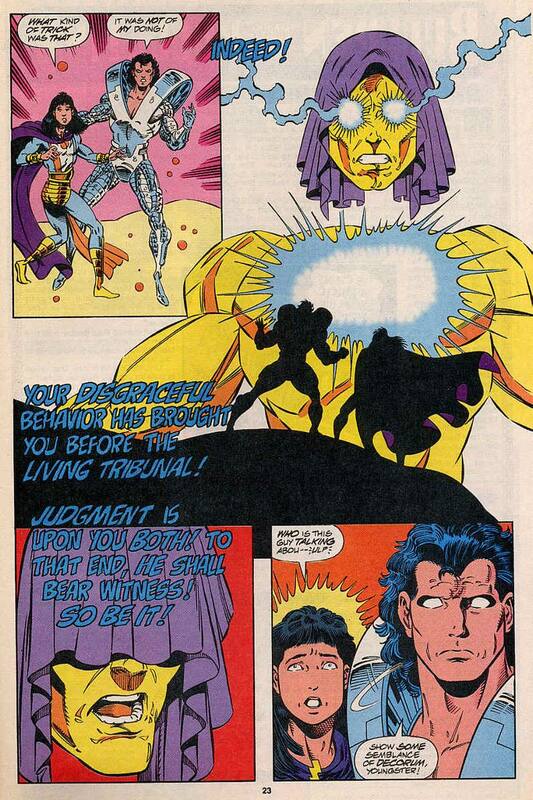 The Hawkgod returns to Eternity and the Living Tribunal and is told that the Approver’s arrival is imminent. 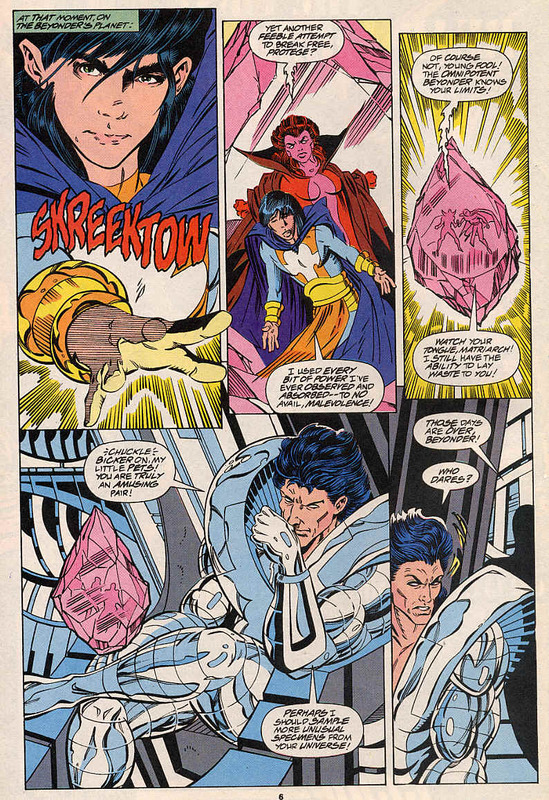 As this happens, the Guardians are also transported away, this time to the Beyonder’s universe to help him with the Protege, Malevolence and Mephisto after the Protege runs him off. 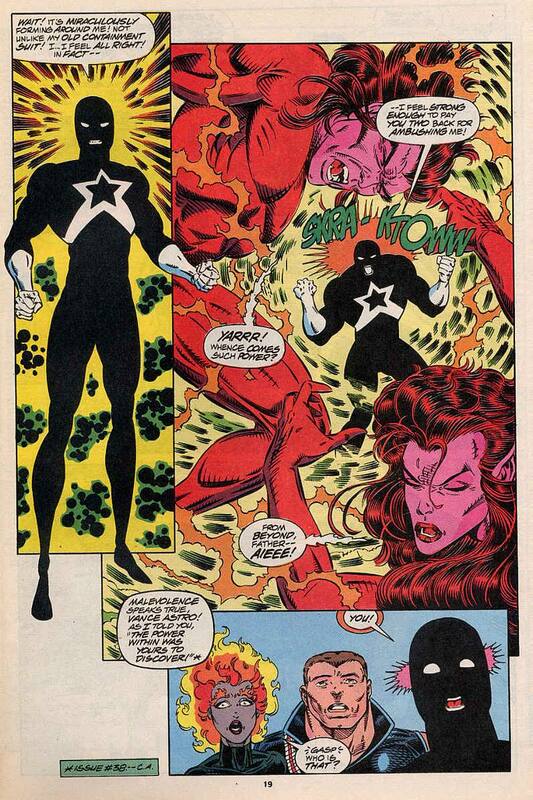 The Guardians arrive to face Mephisto and Malevolence, Mephisto see’s both the Beyonder’s gift of a black undershirt and the preservation spell on Vance Astro and strips the spell away, causing Vance to age and wither. 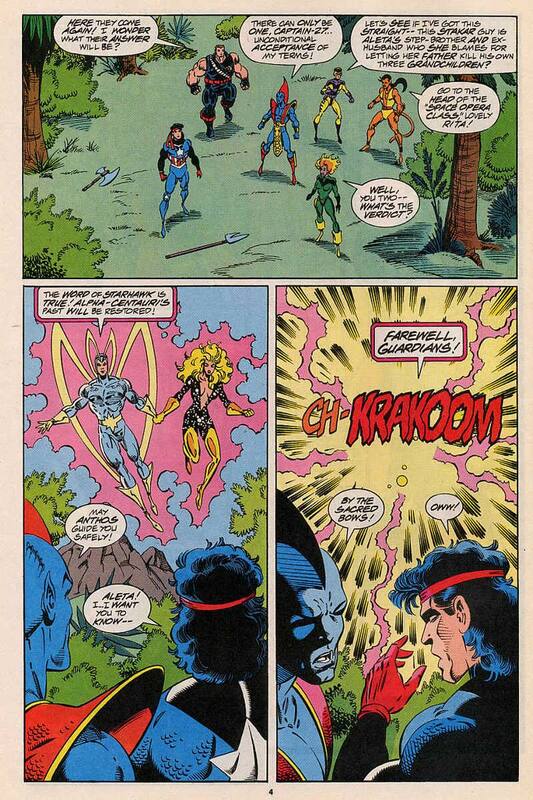 As this happens, the Starhawks arrive on the Badoon homeworld of Moord and disintergrate Yondu’s dagger, thus restoring the true timeline. Vance falls in front of Charlie-27 and Charlie watches the undershirt rip through Vance’s uniform and cover his body as a new containment suit. 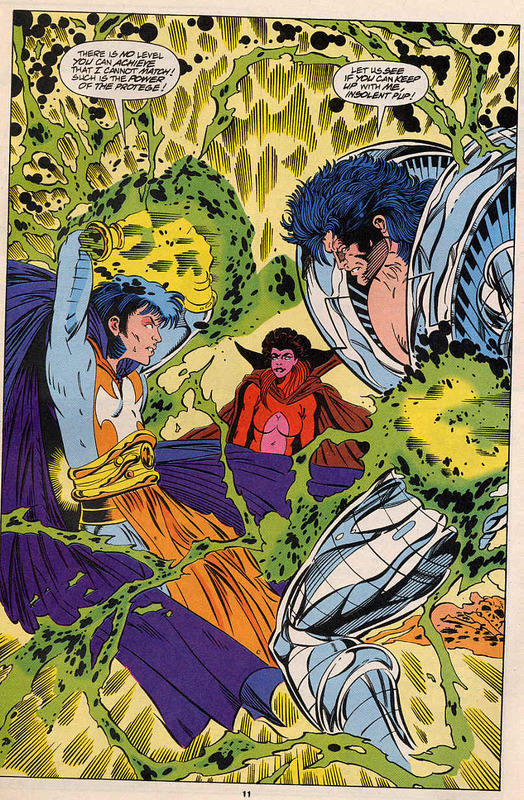 Freed of the pain and fear, Vance stands and blasts Malevolence and her father with a surge of power that none expected, except for the Beyonder. 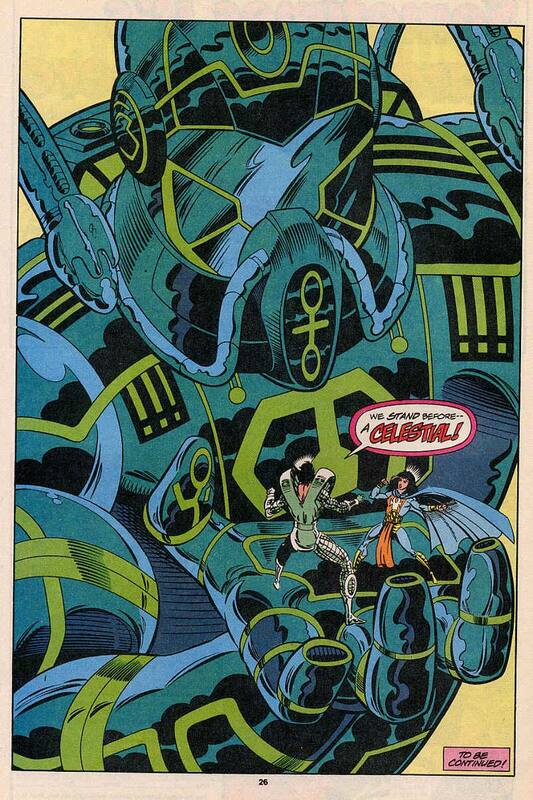 The Beyonder appears, gigantic in size, but is then dwarfed by the Protege. 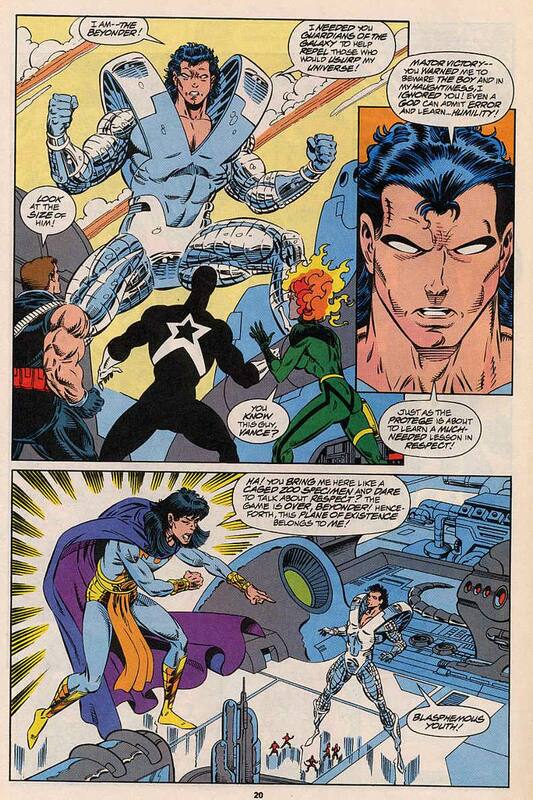 The Beyonder tells Vance that he should have listened and not brought the Protege, but will now teach the Protege a lesson in respect. Before that can happen, they are both teleported away. Notes: This was a pretty fast paced issue which furthers the Protege story and ends the over long Badoon time jolt story. Having two Starhawks does give both of them something to do, sadly it’s only really bickering. There’s a back up feature where fan art is used by Kevin West to showcase potential looks for Talon, who will in the near future get a new look, albeit not one of those. It’s filler, but fun nonetheless. 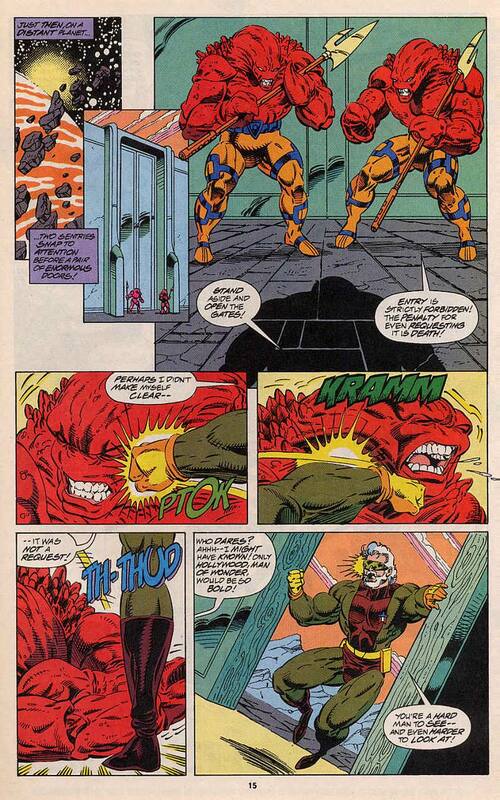 There’s also a sub-plot linked to Hollywood’s Doom Quest, but that’s more for another issue. The last page reveal of a Celestial is a positive. 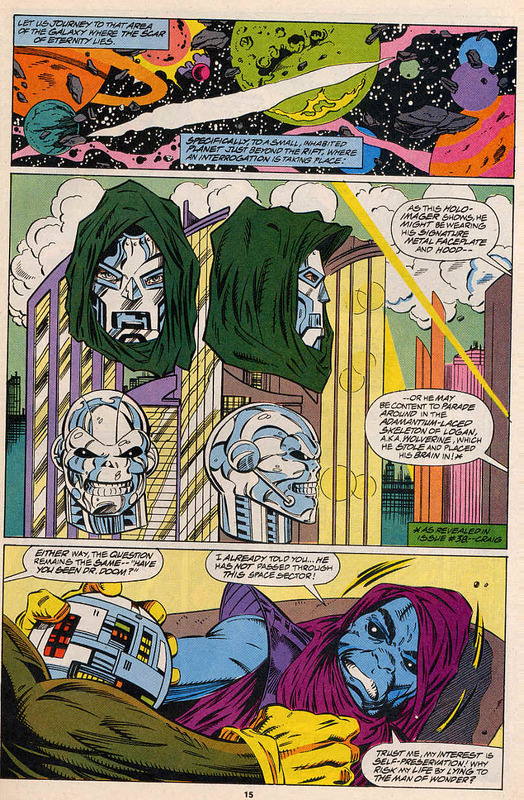 Introduced in the Eternals series in the mid 70’s (Check http://www.dcindexes.com for more precision there), the Celestials were one of the great 70’s ideas by Jack ‘The King’ Kirby and have such a strong presence in the Marvel Universe. 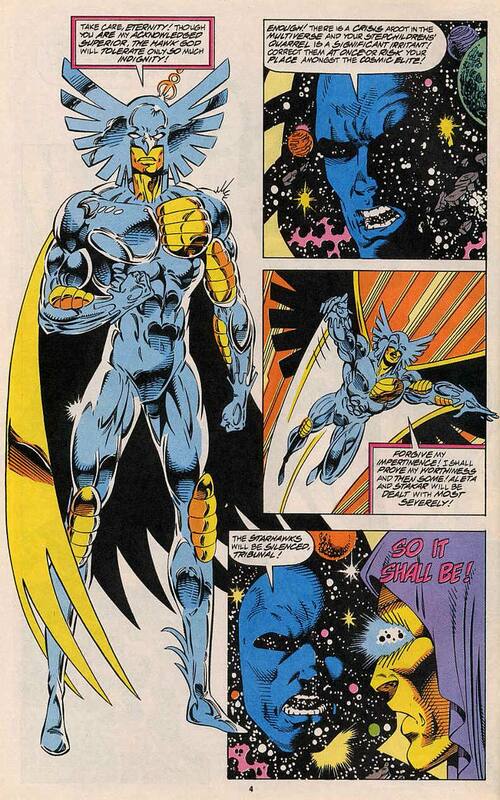 This may be the first appearance of a Celestial in the Guardians’ timeline, but they are a welcome addition. Next Time: It all kicks off and there’s hell to pay. Guardians of the Galaxy 45 was cover dated February 1994 and was on sale December 1993, sharing the spinner rack with Batman: Mask of the Phantasm #1, Codename Stryke Force #1, Fighting American #1, Freak Force #1, Sin City: A Dame to Kill for #1 and Uncanny X-Men #309. They battle fiercly while the Guardians look on and far off in space, others are looking. 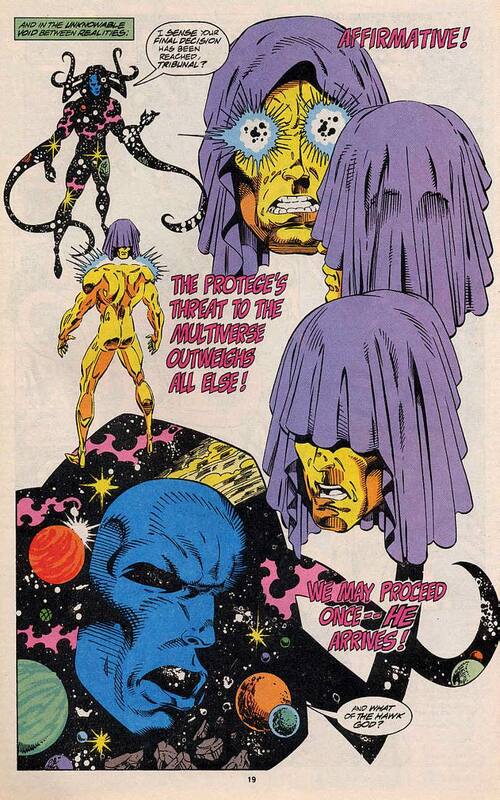 Eternity (the universe itself) and the Living Tribunal, a sort of supreme judge of the multiverse. 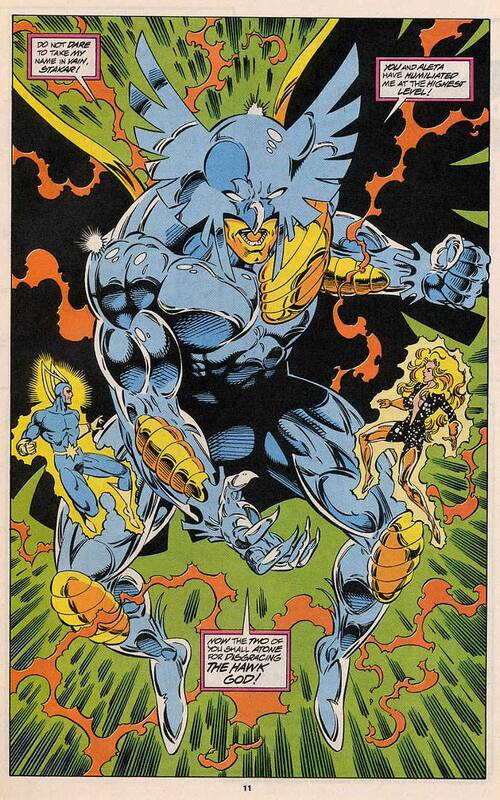 They are both berating the Arcturian Hawkgod for the shameful actions of both of his avatars, the Starhawks. 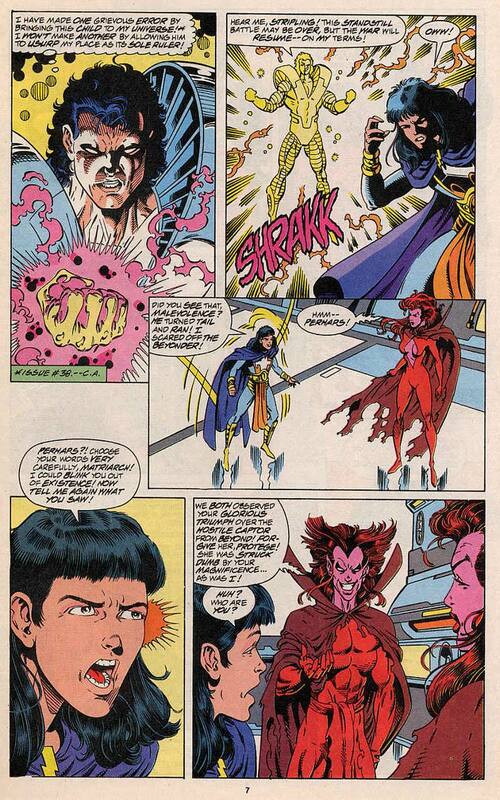 The Hawkgod decides to intervene, while the other two look in on the Protege who is chasing off the Beyonder, before Mephisto introduces himself and attempts to bond with the child. 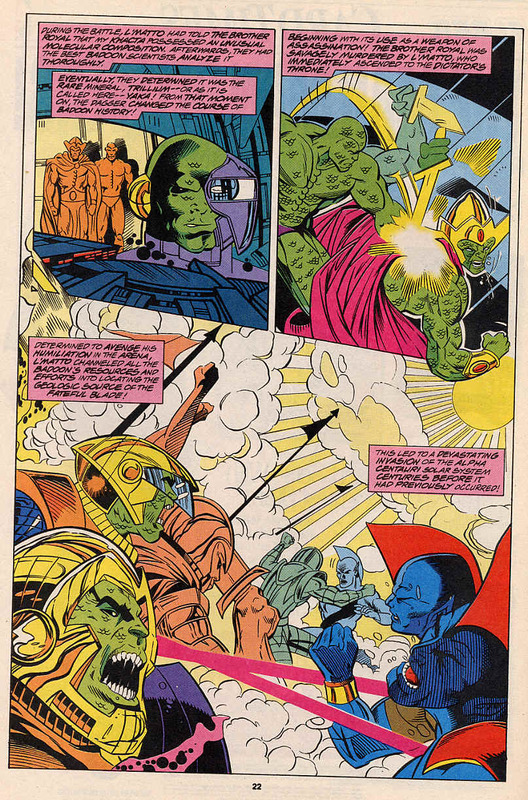 Back on Centauri IV, the Hawkgod appears before Stakar and Aleta and ends their fight, pointing out their need to atone for their actions. 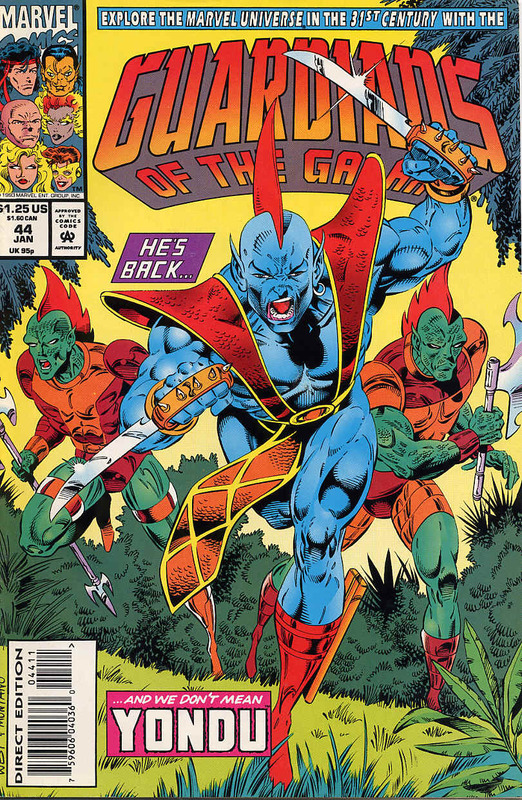 As the Guardians witness this, some Badoon/Centaurian half breeds attack and Yondu for the first time in 20 issues is back with the Guardians of the Galaxy. In an ongoing sub-plot, Hollywood beats up a giant alien informant in his search for Dr Doom, reminding the creature that old he may be, he is not to be trifled with. 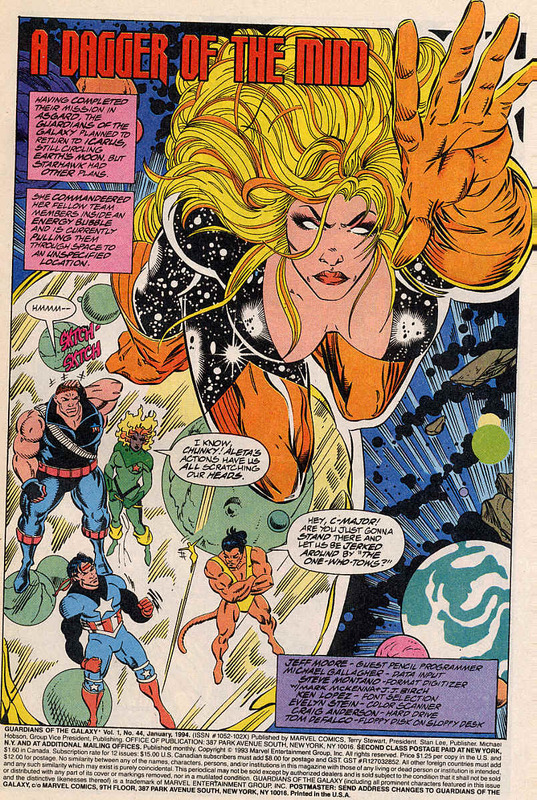 Also Eternity and the Living Tribunal have decided that the Protege is too powerful and has to be dealt with once ‘He’ arrives. 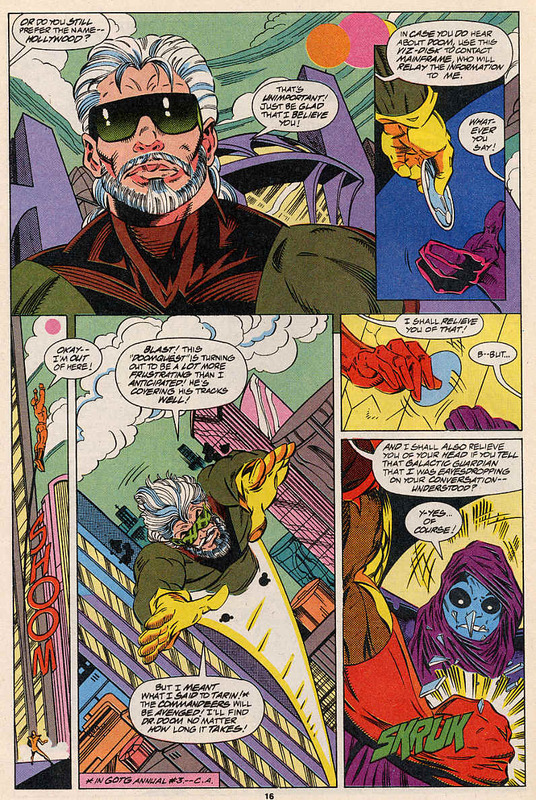 Back with the Starhawks, Stakar recaps his origin to show how he is alive and well now, using the power of Starhawk. 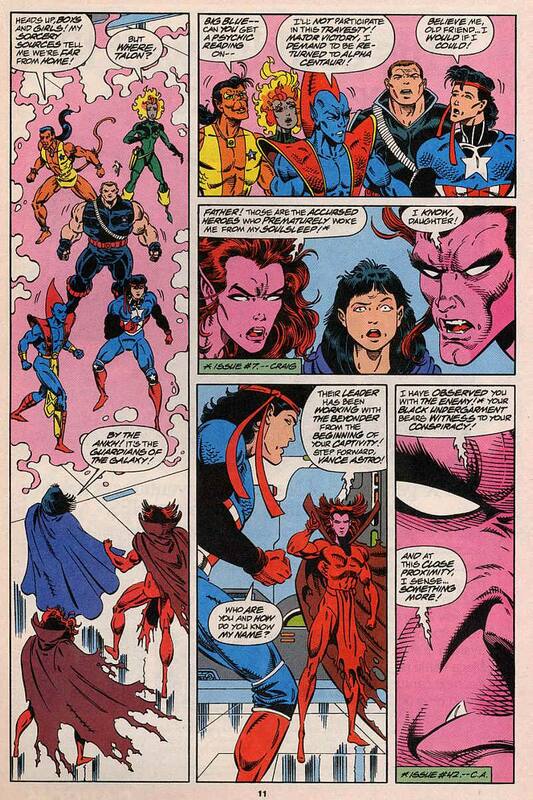 The Hawkgod notes that Stakar has some of his history wrong, but he’s not going to point that out just yet. 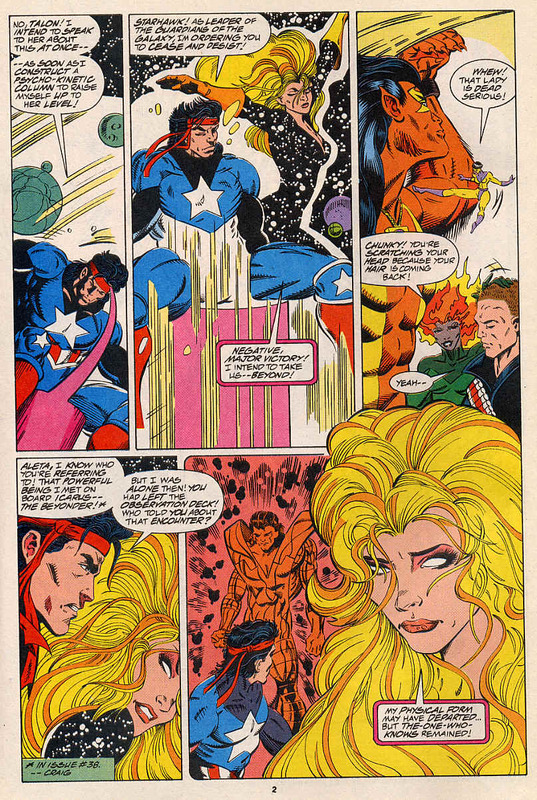 Aleta is still furious with Stakar and the two blast at one another. 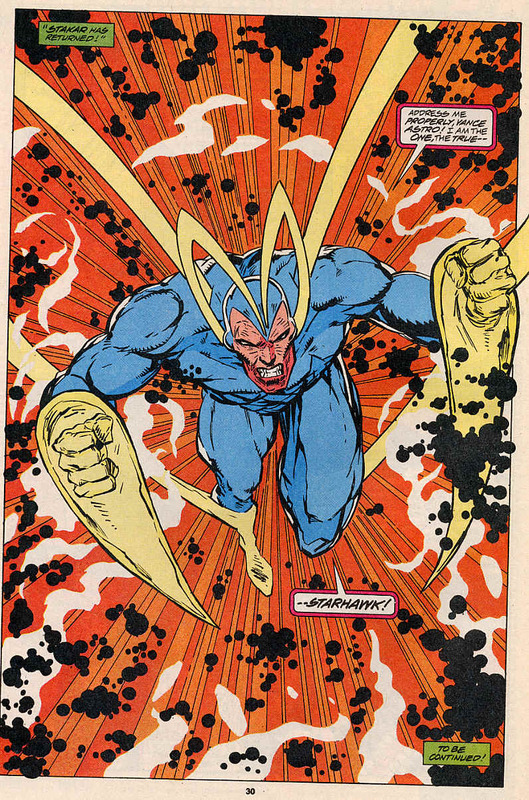 The Hawkgod is even more angry and uses their power to pull them together. 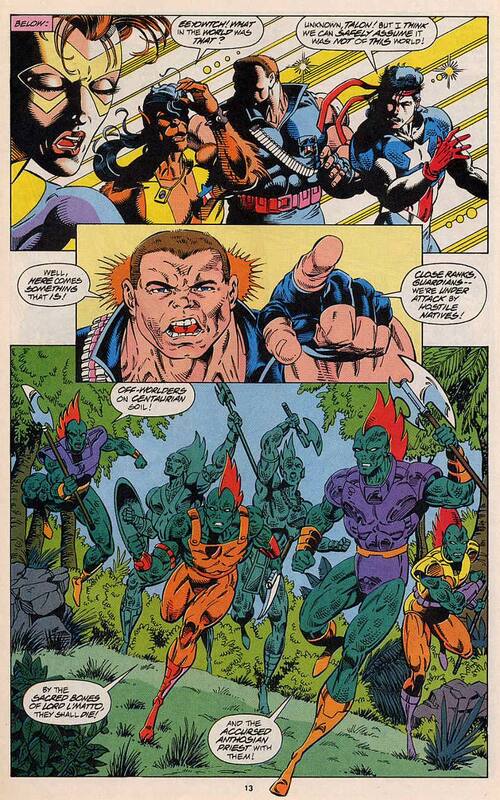 The Guardians run off the Badoon/Centaurians with the help of the battle above them and see Aleta and Stakar hand in hand, ready to fix the time jolt mentioned in the last issue together. 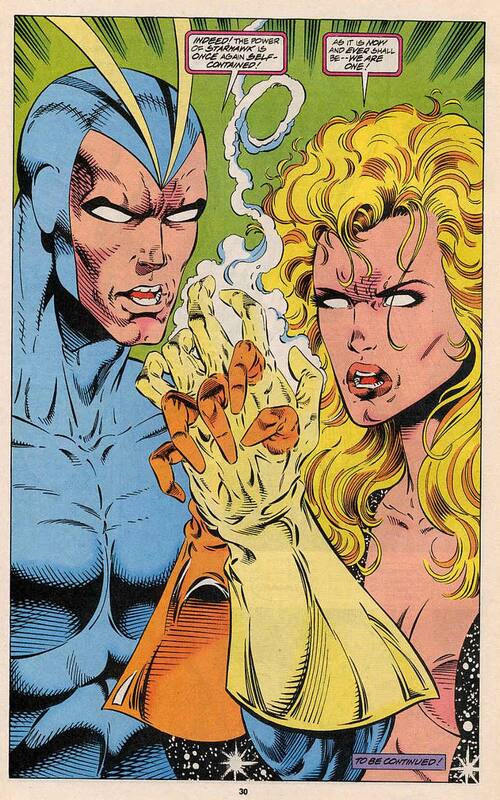 Then they see why, the Hawkgod has fused their hands together. Notes: I have missed Kevin West’s pencils and it’s a welcome return. 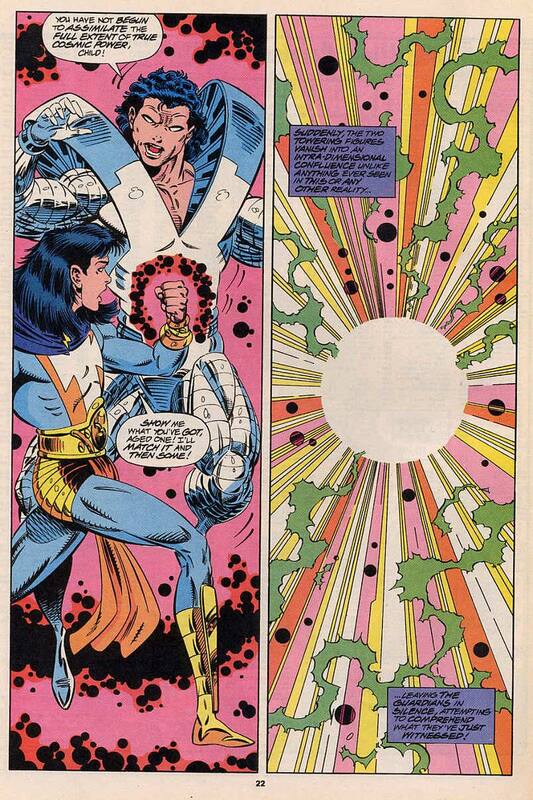 The Protege/Beyonder story is getting a little tiresome now and am glad we’re only a few issues from this being resolved. The Hollywood sub-plot isn’t as long in the tooth, but am still curious about where it’s going. As annoying a character as he was, I’m glad to see Starhawk and also glad to see Yondu, West makes it look like he’s always drew them, even though, non-flashback this the first time he’s drew them. 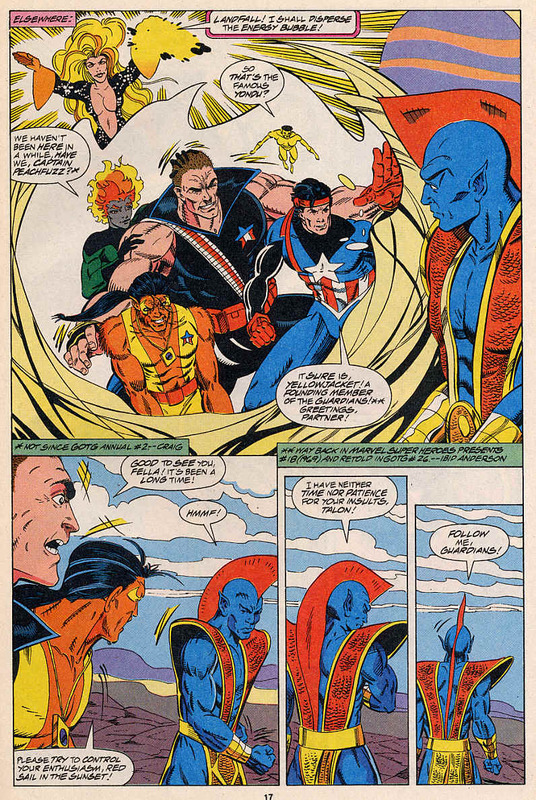 Yondu rebuffs Vance’s attempt to talk to him, reminding the team of the consequences of their trip to the past. 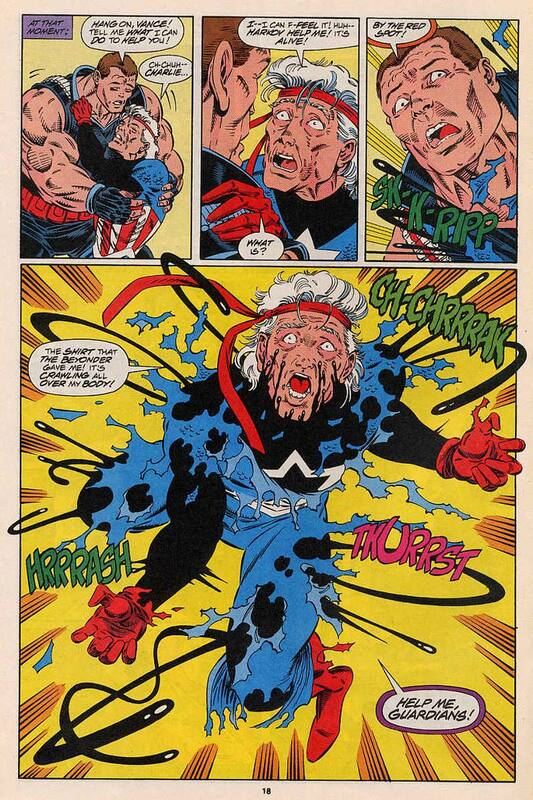 Overall a solid issue, again leading in to a larger story, the tension is mounting. 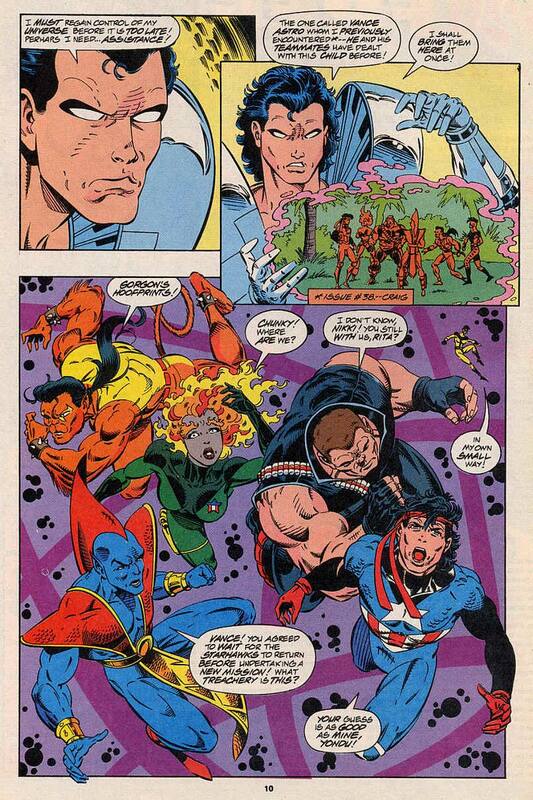 Next Time: The Starhawks go back in time, the Guardians of the Galaxy go Beyond. Guardians of the Galaxy 44 was cover dated January 1994 and was on sale in November 1993, sharing the spinner racks with Aquamana: Time & Tide #1, Hawkeye #1, Hawkman #1, Iron Man #300, Lobo #1 and Marvels #1. 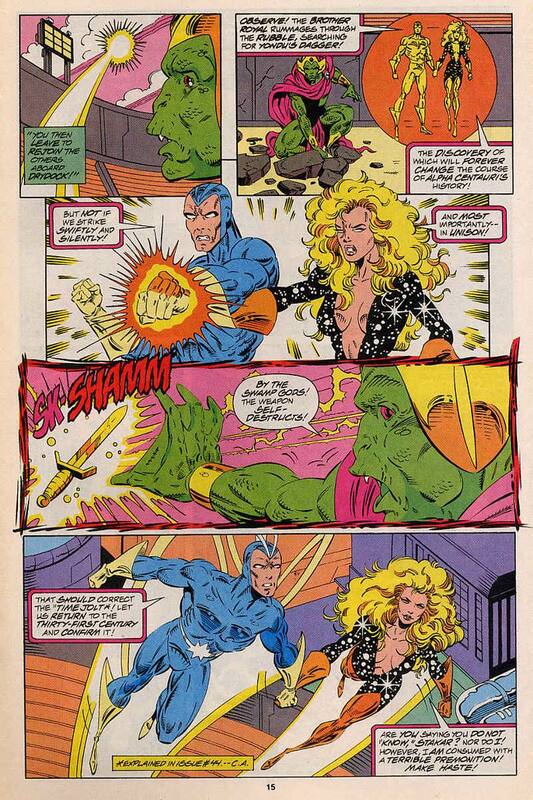 A Dagger of the Mind was written by Michael Gallagher, inked by Steve Montano and guest pencilled by Jeff Moore and opens with Aleta as Starhawk, towing the Guardians of the Galaxy on a quest Beyond. 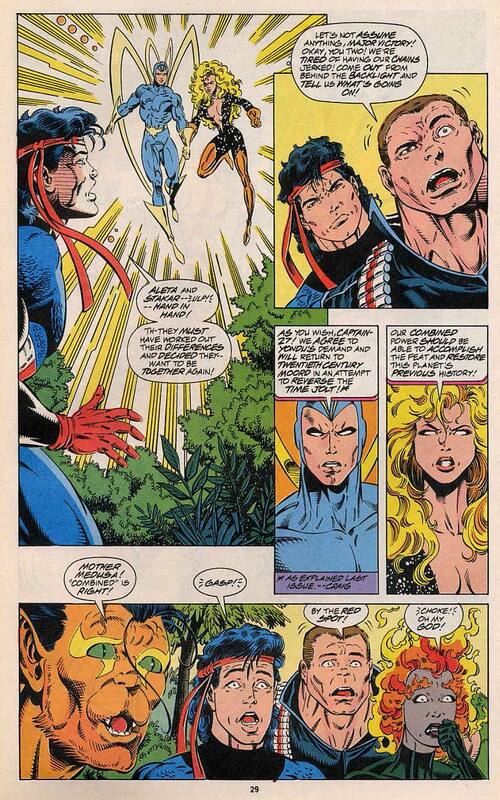 Angered at this unilateral action, Vance Astro confronts Aleta, who tells him that she knew of his meeting with the Beyonder and that they must do what they are doing. She also points out that they need to go through the Scar of Eternity (last seen in GOTG #35) but Vance notices that they are in fact heading for the Centauri system, home of Yondu Udonta. 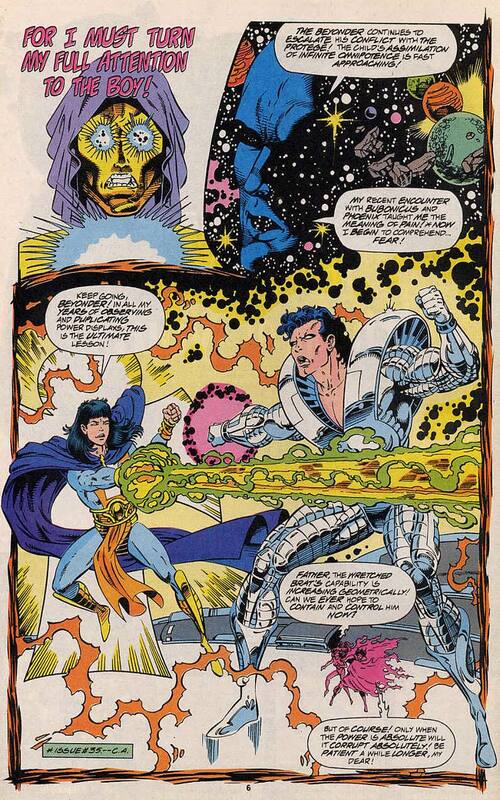 In a place Beyond, Malevolence and the Protege are still trying to escape the Beyonder’s grasp. A being known as the tracker appears destroys the prison holding Malevolence and the Protege and is seemingly destroyed for doing so. 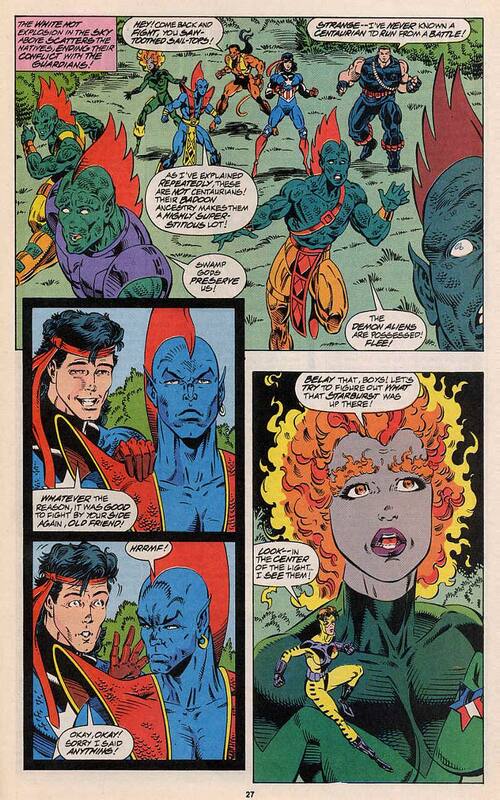 On Centauri IV, Aleta lands the energy sphere in front of Yondu and the rest of the team are overjoyed to see him. And he doesn’t share this. It transpires that time has been re-written for all except the Guardians. 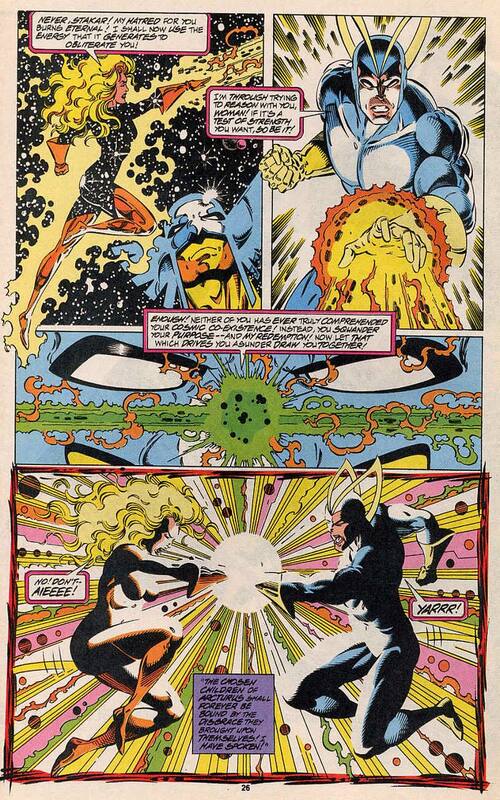 When Charlie-27 battled L’Matto, the Badoon Captain Universe, back in issue 32 he carried Yondu’s knife, when he was evacuated in issue 33, the knife was left behind. 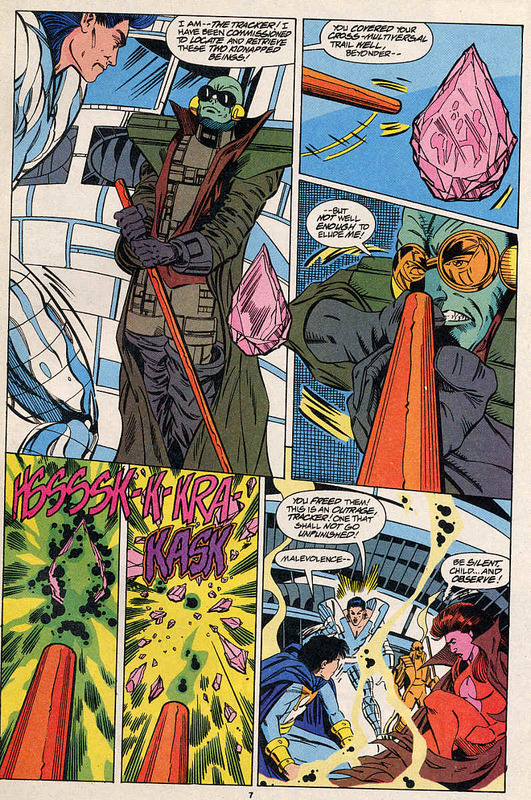 Thus the Badoon learned about the knife’s alloy Yaka over ten centuries too early. 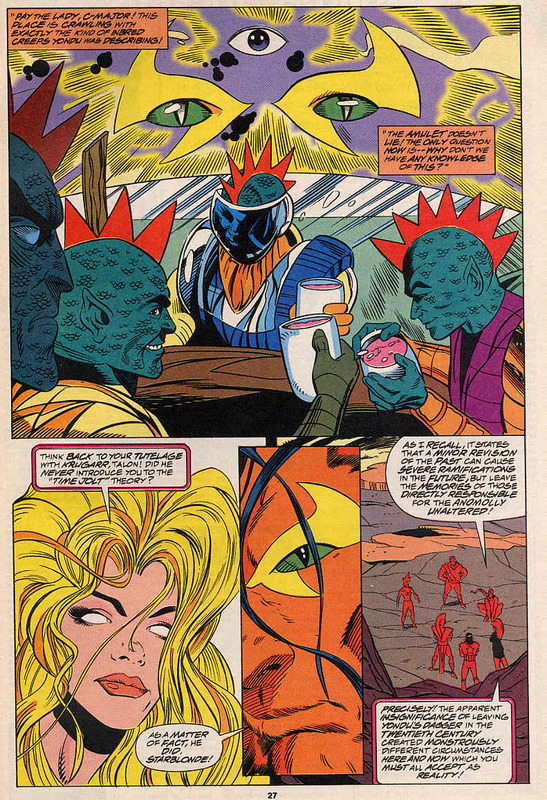 They invaded Centauri IV in the 1990’s and through genocide and interbreeding, the half Badoon/half Centaurians are the majority. 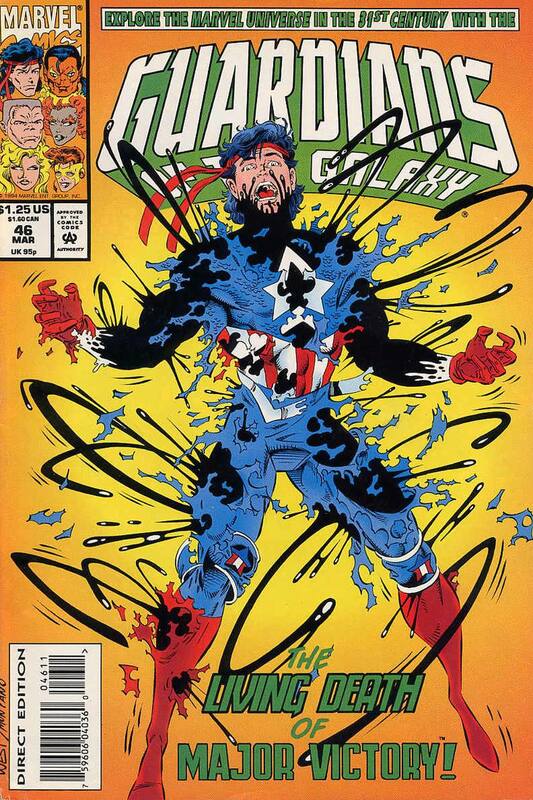 Yondu, quite understandably, blames the Guardians for this. 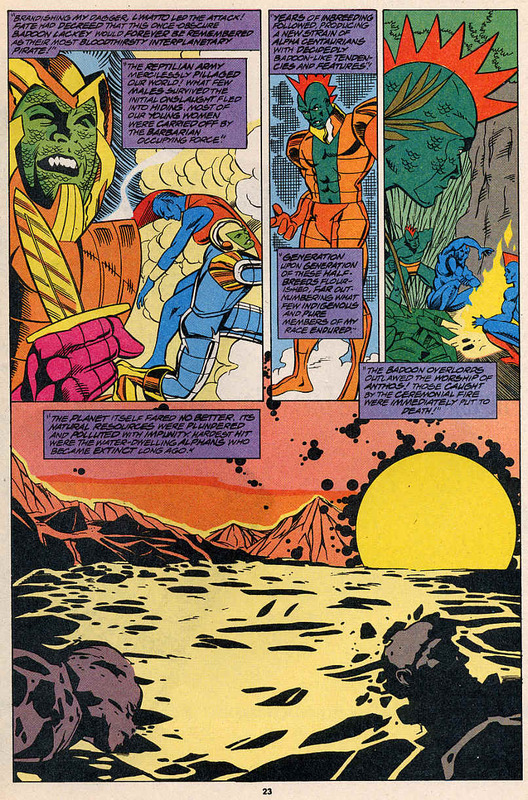 Despite not remembering any of this, Talon checks it out and sees the vast numbers of half breed Badoon and the state of the planet’s eco-system. 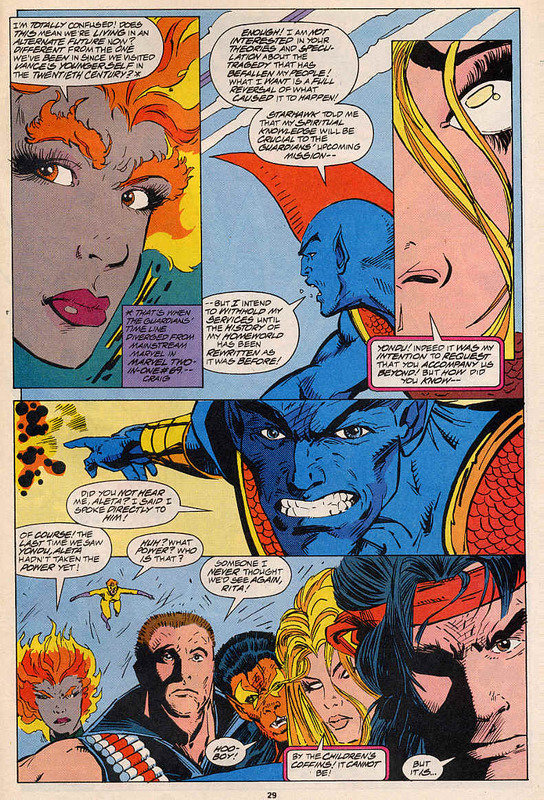 Yondu points out that he knows his knowledge will be of use, but he has told Starhawk that he wants the true timeline restored before he agrees. 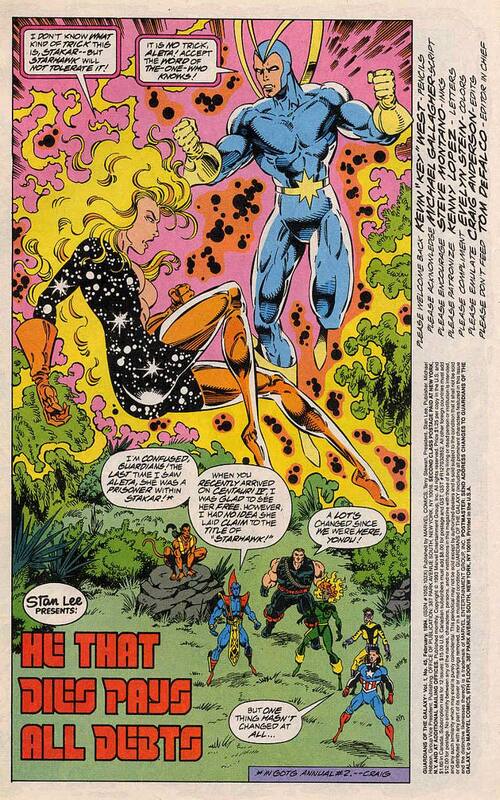 When Aleta comments that she made no such deal, Yondu angrily points out that he referred to Starhawk and points to the sky where Stakar, the original Starhawk has returned. Notes: Yondu’s back…. now for the bad news. With another guest artist, we’ve been left with an art team ill suited to this team and the book itself. Fortunately Kevin West returns in the next issue. 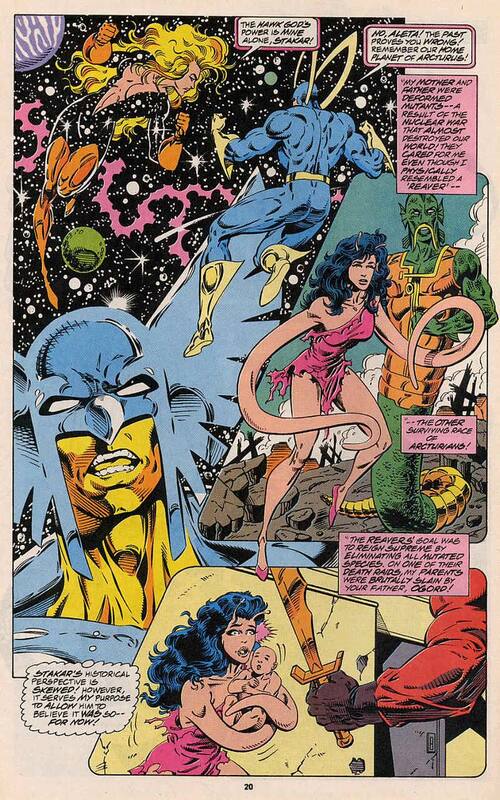 While not a particular fan of this new Starhawk version of Aleta, it is interesting to see her react to the return of the Starhawk version of Stakar. 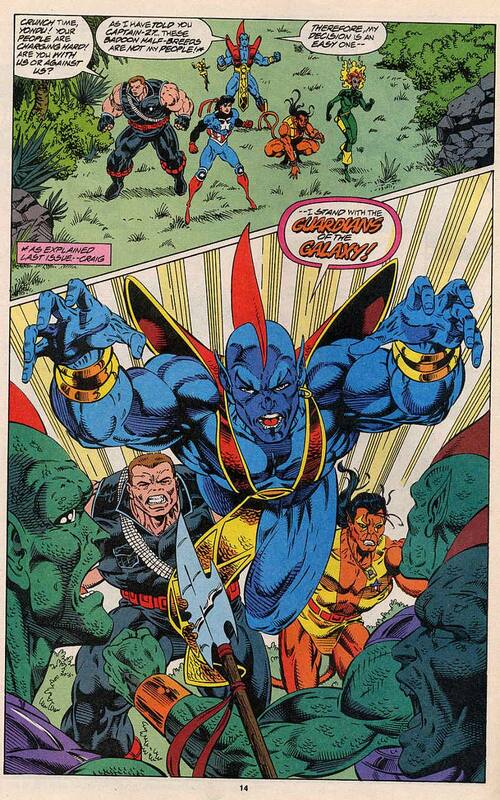 Yondu is a welcome addition to the comic, it has been too long since he was in it and this more angry version makes sense in the story rather than some forced conflict. The Doomquest starts making headway and that’ll get more interesting later on as does the Beyonder/Protege storyline, but not in this issue. The timejolt theory used to explain how different people remember different things is a bit of a stretch, but as time travel theories go, there are worse. The biggest problem I have is that even within the story, this is impossible. 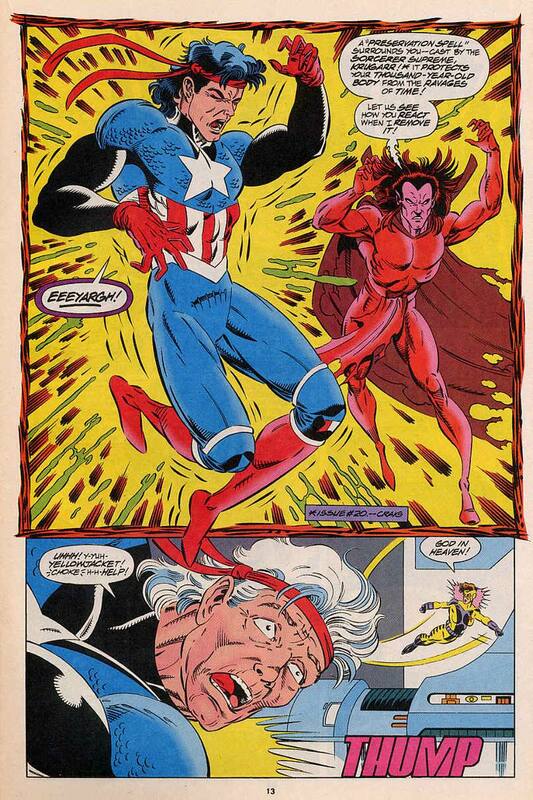 If you recall from issue 27, the Guardians travel back along their own timeline (Earth 691), but find themselves in the present Marvel Universe (Earth 616) due to the effects of the Infinity War. So that means that the knife that started this whole mess was in Earth 616 and the Guardians went to their future which is Earth 691, which broke away from the 616 back in Marvel Two in One 69 which is before the Infinity War. So the knife should have stayed in the 616 universe and effecting that timeline and not the one that the Guardians live in. This might seem a bit of nit-picky problem, but to be honest, it took me out of the story and once you’ve done that, it’s hard to really care about what is happening. A more positive note is that the issues after this do get better and there’s more exciting stuff coming, for that I can forgive a lacklustre issue. 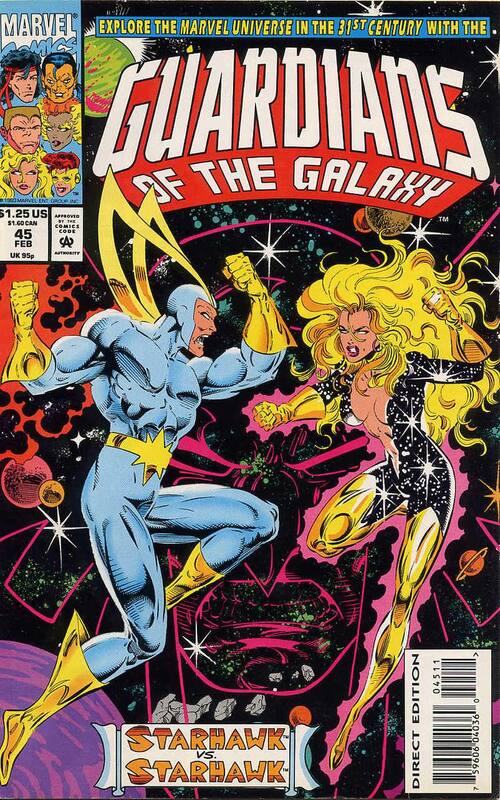 Next Time: Guardians of the Galaxy vs the Halfbreed Badoon, Hollywood vs a big lizard, Protege vs the Beyonder and Starhawk vs Starhawk and the stakes only get higher from there.